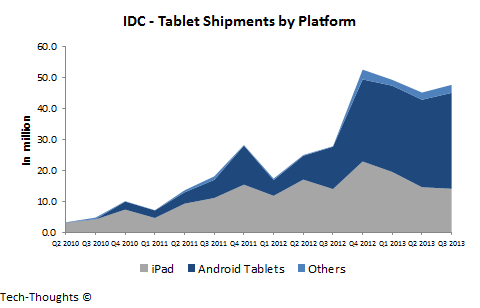 IDC recently announced their tablet shipment estimates for Q3 2013 that showed a 6% growth over the previous quarter. This growth was entirely driven by large, branded Android tablet vendors as iPad demand declined ahead of the product refresh. This left the Android platform with a 65% share of the overall market. Let's take a deeper look at these figures in context of tablet market tiers. In the chart above, tier 1 Android tablet vendors include Samsung, Asus, Lenovo and Acer, while all other Android vendors (incl. Amazon, white-box vendors, etc.) are listed under tier 2 & 3. Based on this categorization, shipments from tier 1 Android vendors overtook the iPad in Q3 by gradually poaching price sensitive iPad customers (or potential iPad customers). These upmarket moves, combined with Apple's pricing decisions, led to a greater than expected decline in iPad shipments. While iPad sales are likely to grow in the holiday quarter (first weekend sales should certainly be strong), the scale of that growth may be in question. 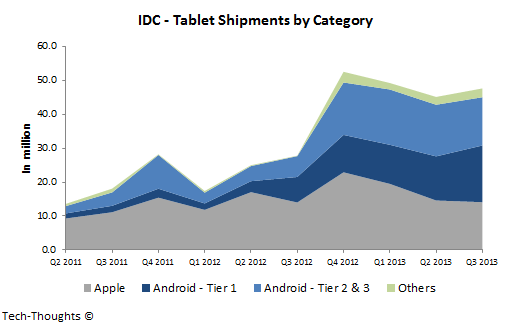 In addition to this, tier 1 & tier 2 Android tablets are likely to see strong growth as well. Based on this, Q4 may well turn out to be a make or break quarter for the iPad.